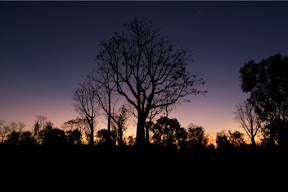 Towards sunset today we visited Marlgu Billabong in Parry Lagoons Nature Reserve. We’d been told it was a good spot for water birds but it was amazing. It’s a major migration center and there were just thousands of ducks, geese, herons, etc. of various species, including Brolgas - a big stork-like bird reminiscent of a flamingo. 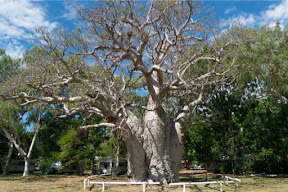 Wyndham also claims to have the biggest Boab tree “in captivity”. This tree is said to be 2000 years old! At last, another giant something! 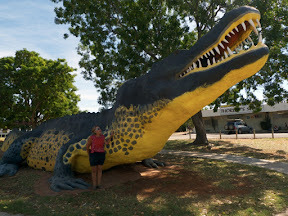 This monster crocodile is in the small town of Wyndham which is on the Timor Sea, at probably the northern point of Western Australia, and thus in the middle of croc country. 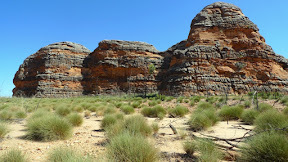 Leaving the caravan, and Tigger, at a caravan park in Turkey Creek, we made a day trip into Purnulu National Park to see the the Bungle Bungle mountain range. The main part of this journey was 53km along a rough, unsealed 4WD-only road. Rainy season rivers have eroded narrow gorges. Some of these are too narrow for people to pass each other but go back several hundred yards into the rock. 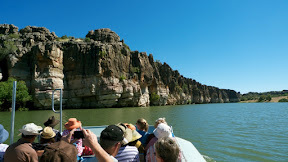 We took a ranger-guided boat trip in Geikie Gorge National Park where I photographed this crocodile. Of course, this is a Freshie - a freshwater crocodile - which is not considered dangerous. 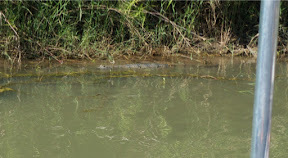 How do you tell a Freshie from a Saltie - a saltwater or estuarine croc? If it swims away from you it’s a Freshie. If it swims towards you it’s a Saltie! Just outside Derby is this natural rock formation called ‘China Wall’ due to its resemblance, after a fashion, to the Great Wall of China. 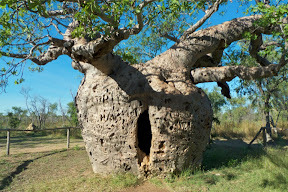 At the town of Derby, near Broome WA, we saw this boab tree that had once been used as a jail cell! The police used it as a stopover when conducting prisoners in from the bush. We arrived back on the coast at Port Hedland, one of the mineral loading ports along the northwest WA coast. This is a BHP Billington town - a competing mining company to Rio Tinto. The town has little to offer a tourist - just railway lines, mile long ore trains, and port loading facilities. It does have a salt mine however, and the huge white piles are visible from far away. We just stayed a day to shop for groceries and then we headed north towards Broome. 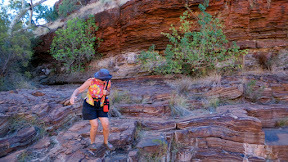 Near Tom Price is Karijini National Park which we visited for a day. It has some interesting geological formations showing lots of different colored layers. The darker layers are almost all iron ore bearing! 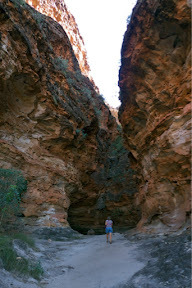 The park’s most picturesque features are some narrow deep gorges cut by the rivers. 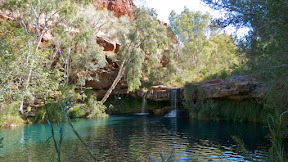 We visited a couple of the gorges and hiked to their waterfalls and pools. From Exmouth we went inland to visit the Pilbarra region. 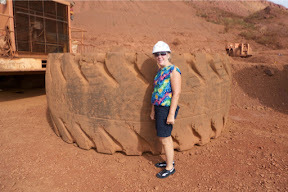 This is a major iron ore region and we visited a couple of mining towns. This towns seem a little odd because they were entirely built by and for the mine. They would not exist without the mine, so everyone in town is connected with the mine in some way. 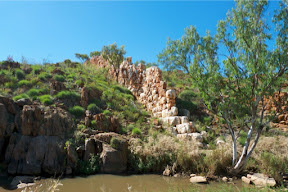 At the town called Tom Price, we went on a guided tour to the nearby Tom Price Iron Mine, owned by Rio Tinto. We were shown the process from the rock being loaded onto massive dump trucks, through to the processed ore being loaded onto mile long trains to take it to the coast. The railway line and the port at Dampier are also owned by the mine. 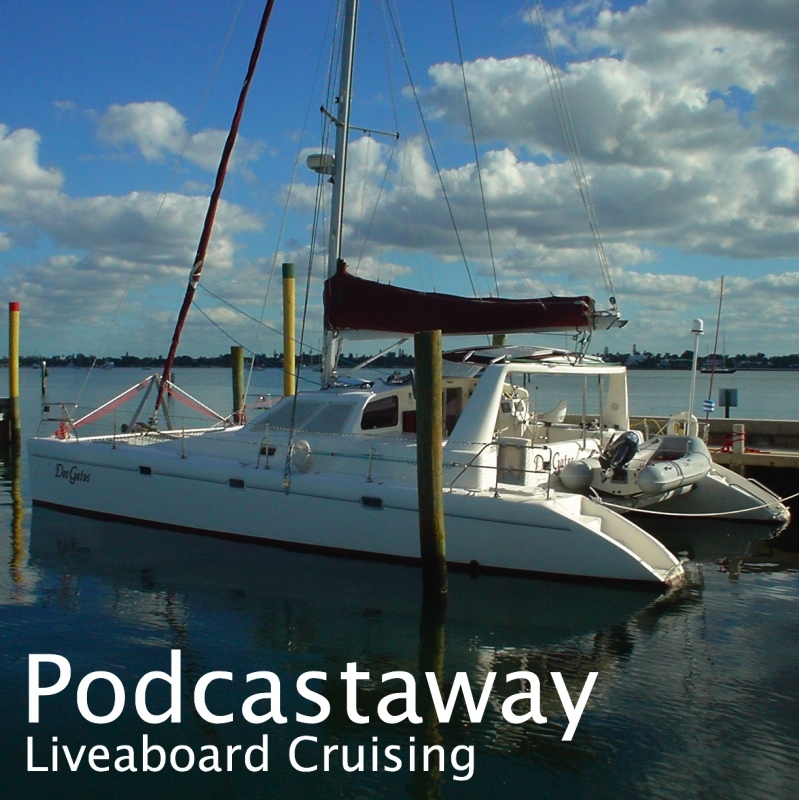 We stayed on in Exmouth for a week in total, mainly because we wanted to make a night dive at the Navy Pier. 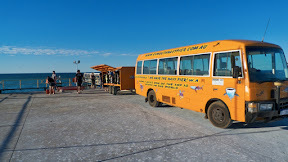 This is a famous dive site that is only dived by one dive operator in Exmouth. They are the only one permitted, and were the company we used for our whale shark trip. They only night dive a few nights a month when the tides cooperate, so we had to wait a few days. The pier was built for the US Navy that runs an ultra-low frequency transmitter station at the end of the peninsula. This is used to communicate with submarines. We made two dives off the pier, one in the day to get our bearings, and one at night. Visibility was only average but we saw quite a lot of interesting fish, including a wobbegong shark, a grey nurse shark, toad fish, sailfin catfish (unique to Ningaloo Reef) and schools of batfish and jacks. We’re in Exmouth WA near the Cape Ranges National Park and Ningaloo Reef. This time of the year, this is the go-to place for seeing, and swimming with, Whale Sharks. We went out with one of the local dive outfits - Ningaloo Dreaming. There were 20 tourists and 5 crew on the 60’ boat, and they also have a spotter plane that goes out to locate the whale sharks for us. 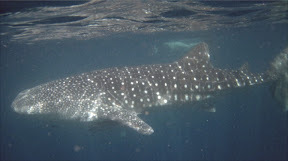 During the day, we swam with three whale sharks of lengths around 6, 5 and 8 metres respectively. We were divided into two groups of ten so that there were never too many people in the water near the fish. Also, we had to stay 3m from its body and 4m from its tail. They move effortlessly through the water so we have to swim alongside to keep pace. The first two were more leisurely, the third one made us work! We had several sessions with each shark and had well over an hour of total time swimming with them. The last time we looked for whale sharks was in Utila, Honduras, where we only saw them for a few seconds before they dived. The photo above was taken by one of the crew who gave us a CD of photos after the trip. A great day!